High school students take Advanced Placement courses to earn college credit. Bahiya Nasuuna hasn't even started college, but she already has several academic credits in the bank that will give her a jump on graduation. "My parents need as much help as they can get [to cover tuition]," said Nasuuna, who will be attending the University of Massachusetts, Amherst this fall. Nasuuna passed seven Advanced Placement exams at her public high school in Chelsea, Mass., including one in English that will allow her to forgo an introductory writing course her freshman year. She is one of a growing number of students getting a head start on college credits while they are still in high school, cutting costs and speeding toward degrees -- and jobs -- as quickly as possible. But it's not just about taking AP tests. High school students are also enrolling in college courses, receiving college credit for life experiences, such as community service or being able to speak a foreign language, or even skipping their junior or senior year altogether to attend so-called "early colleges." "Everyone is looking for a leg up," said Dave Taylor, principal of the Dayton Early College Academy in Ohio, a charter high school where students simultaneously enroll in classes at nearby Sinclair Community College and start earning college credits as early as their sophomore year. Some 1.3 million students took classes for university credit before completing high school during the 2010-2011 academic year, up 67% since 2003, according to the U.S. Department of Education. Much of this trend is being driven by the skyrocketing cost of college. Students enrolled in early college high schools, for example, earn an average of 36 college credits, nearly a third the number they'll need for a bachelor's degree, according to a study by the advocacy group Jobs for the Future. But there's also evidence that exposing high school students to the challenges of college-level work can increase their eventual likelihood of success. More students who take college-level courses in high school go on to college than their classmates who don't, a report released in June by the American Institutes for Research, or AIR, found. They're also more likely than their peers to stay in college once they get there, earn higher grades, and eventually graduate, according to a separate study conducted in Florida and New York by the Community College Research Center at Teachers College, Columbia University. "What we hear from kids all the time is, 'It's amazing to me that I can sit in a college classroom with 22-year-olds,'" Taylor said. "When you're actually doing college work, it ups the ante quite a bit, so they feel like they can compete and be successful wherever they might choose to go." 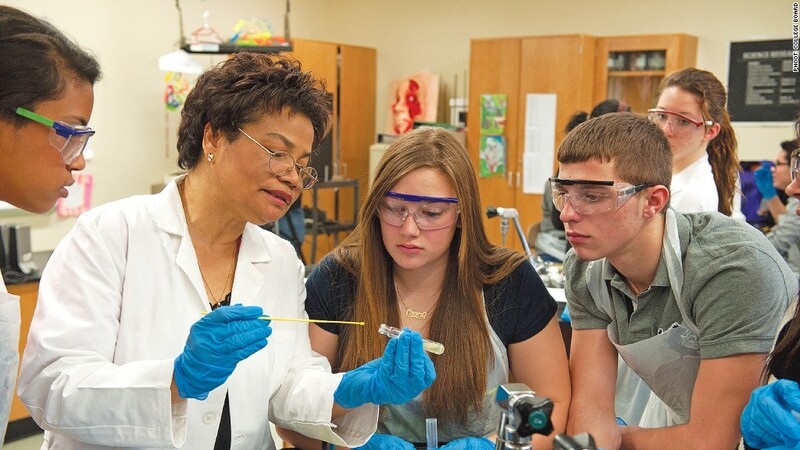 Most college courses that are offered in high schools are taught by faculty from two-year community colleges under so-called dual-enrollment partnerships. They're conducted either in the high schools themselves or at close-by higher-education institutions. Related: How much will that college really cost? In Oregon and Colorado, some students can take a fifth year of high school, using it to earn credits at nearby community colleges. Since they're technically still enrolled in their local school districts their tuition, fees, and textbooks are paid for by state funding for public-school education. The universities and colleges have motivations of their own for going to this extra trouble. "They know they would otherwise get students who are unprepared, who end up in remedial courses, or who don't graduate," said Joel Vargas, vice president of Jobs for the Future. High school students can also take the College Level Examination Program test, or CLEP, and if it shows they've mastered any of 33 different college-level subjects from what they've learned in jobs, through community service or because they're fluent in a language other than English, they can submit the results for prospective college credit. This doesn't mean that every university or college will accept all of the credits students earn, though a survey by the Western Interstate Commission for Higher Education found that 92% of public institutions nationwide give credit for at least some dual-enrollment courses and 91% for AP exams. An added benefit from doing college-level work in high school is that it allows students to experience what higher education is like while still living at home. "What we're seeing more of now is a greater emphasis on programs that are smoothing over the college transition," said Adam Lowe, executive director of the National Alliance of Concurrent Enrollment Partnerships. On the opposite extreme are early colleges that put 10th or 11th graders who have outgrown what their high school can offer them into college courses and directly on the fast track to a degree, with a high school diploma conferred along the way. All are private, and charge the usual college tuition. "Students talk about how relatively isolated they felt in their sending schools because they were interested in Plato and their classmates were interested in the five-paragraph essay," said Peter Laipson, provost at Bard College at Simon's Rock, which enrolls students as young as 16. But whether they end up going to a four-year university or a community college, these high school students are smart enough to know they're saving themselves and their families a lot of money. "Certainly we hear that anecdotally -- that I got this almost for free," said Andrea Berger, who led the research work at AIR. "And certainly they are getting [a degree] for less money."